Scrap tires are unwanted or discarded tires that are not on a vehicle. 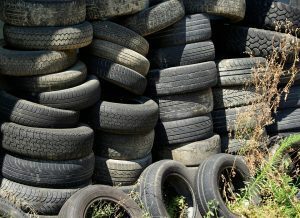 Abandoned scrap tires are considered a public health nuisance because they become ideal breeding grounds for mosquitoes, pose a potential fire risk, and create unsightly nuisances in our environment. Ideally, scrap tires are stored in covered containers or inside buildings until they can be transported to a tire recovery/disposal facility by a registered tire transporter. Class I Scrap Tire Recovery Facility – A scrap tire recovery facility with a permitted daily design input capacity of 200 tons of scrap tires per day or greater. Class II Scrap Tire Recovery Facility – A scrap tire recovery facility with a registered daily design input capacity of less than 200 tons of scrap tires per day. Scrap Tire Storage Facility – Any facility where whole scrap tires are stored prior to being transported to another destination (final storage or disposal). Class I Storage Facility – Permitted capacity of more than 10,000 square feet of effective scrap tire storage no greater than three acres. Class II Storage Facility – Registered capacity of not greater than 10,000 square feet of effective scrap tire storage.